Slightly larger than the #1 chain, the #2 size is used for fine jewelry such as necklaces and bracelets, and can also be used for (advertising items), key chains, neck chains, etc. A versatile chain that can be used for a wide variety of applications. These chains can be used as pull chains for lights and ceiling fans, as retention chain for items such as pens, filler and dust caps, tags, NAS parts, and assemblies. It is also used as larger and stronger key chains, necklaces, identification chains, law enforcement badge holders, and more. This chain is popular as drive chains for vertical blinds and in the plumbing industry for basin plug stoppers. It can also be used for stronger retaining applications. 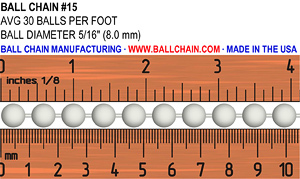 The smallest of the "industrial size" chains, the #13 chain can also be used for most of the applications of the smaller chains when extra strength is needed. Also used for ShimmerScreen. 1/4" 6.3 mm 36 40 lbs. 90 lbs. 130 lbs. 90 lbs. 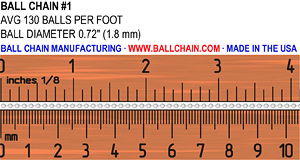 The second largest chain available, used primarily for heavy industrial applications and ShimmerScreen. 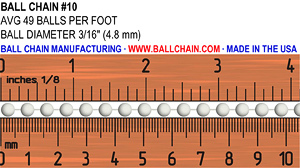 1/2" 12.7 mm 19 125 lbs. 175 lbs. CHECK 175 lbs. 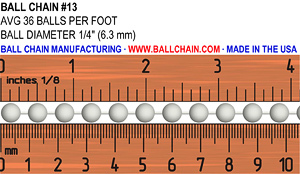 The biggest ball chain available and used primarily for special industrial applications and ShimmerScreen. 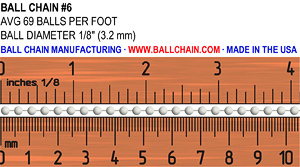 5/8" 16 mm 16 140 lbs. 175 lbs. CHECK 175 lbs.